Weather conditions will improve throughout the Garden State Wednesday, but are you ready for another big cooldown? Tuesday night's weather was disgusting, to say the least. Depending where in New Jersey you live, you either experienced a very cold, uncomfortable rain or some snow. Top snow total as of this morning has been 3.3 inches at Wantage, Sussex County. As of early Wednesday morning, we're down to sprinkles, flurries, and thick clouds. All of those items will improve as the morning presses forward, with peeks of sunshine expected by Wednesday afternoon. High temperatures will be fairly pleasant for early December, around 50 degrees across the state. Wednesday night looks seasonably chilly and meteorologically quiet, with partly cloudy skies and lows in the lower to mid 30s. Our next cooldown looms near, and it's going to be a doozy. This one isn't just about chilly temperatures - the wind is going to be fierce and even painful at times from Thursday night through part of Saturday. 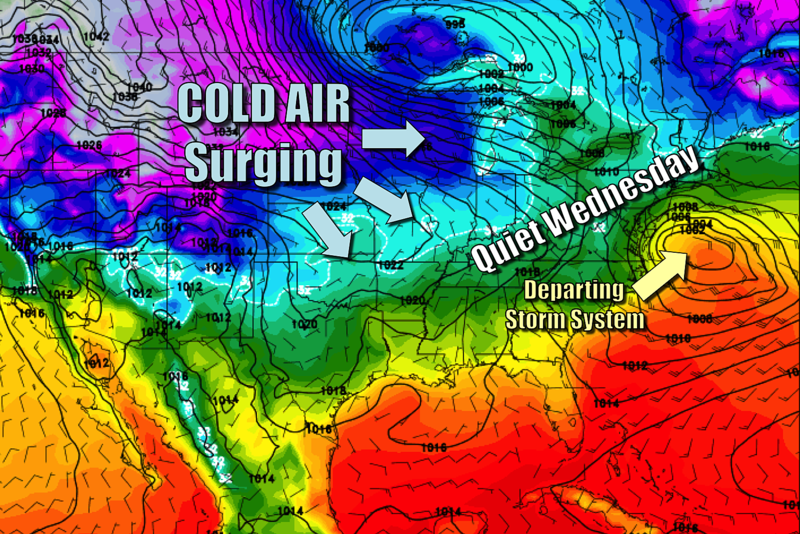 The cold front that will open the door to this arctic air will cross New Jersey during the day Thursday. Now, if moisture increases enough as the front's lift passes across New Jersey, we could see a few rain and/or snow showers develop. But any precipitation on Thursday will be light, if it happens at all. You'll start to feel the cold air Thursday afternoon, as high temperatures will be limited to the mid 40s. By Thursday evening, a brisk west-northwest wind will start carrying that colder air over New Jersey. Friday morning's low temperatures will likely drop into the mid to upper 20s. And Friday afternoon's high temperatures will be limited to the upper 30s to around 40 degrees. That alone is downright cold - our coldest day since early March, in fact. But we have to talk about the "wind chill" too, as the wind is expected to gust above 30 mph throughout the day Friday. Yes, this is going to be painful cold, likely requiring some combination of a coat, hat, scarf, and gloves. At least skies will be mostly sunny. Saturday won't be much better, with another frigid morning and another cold afternoon in the upper 30s, at best. There are significant inconsistencies and high uncertainty among medium-range models beyond Saturday. Sunday looks chilly, with highs only in the upper 30s to lower 40s. The, our next storm system looks to arrive Sunday evening. Temperatures will probably be cold enough at the onset to initiate some wintry weather. However, we need a lot more clarity before we can accurately forecast timing, intensity, accumulations, and location of any rain-snow line. Temperatures are also up in the air for early next week. Models are so flip-floppy that you can literally pick a number between about 30 and 55 as a forecast high temperature for Tuesday. I'm leaning toward the cooler side of that range.